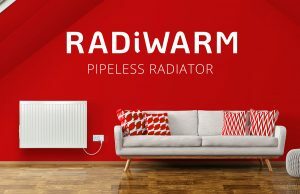 RadiWarm have been manufacturing ‘Pipeless Radiators’ for almost 20 years. Each water-filled radiator looks like a conventional radiator but hides an internal energy-efficient boiler and pump, transforming it into a self-contained heating system. They combine the heat quality of gas central heating systems with the simplicity of electric heating.